Eighteen-month-old Chandni Kol with her mother Savita Kol, 24. Chandni’s birth was not registered in her village, she has never visited a doctor and has received no immunisation. I read this article and found it very interesting, thought it might be something for you. The article is called Why National Nutrition Mission Must Focus On Improving Women’s Well-being https://www.indiaspend.com/why-national-nutrition-mission-must-focus-on-improving-womens-well-being-54068/. Chitrakoot, Uttar Pradesh: About 400 metres from the sub-divisional magistrate’s office in Manikpur block of Uttar Pradesh’s Chitrakoot district, 18-month-old Chandni Kol sat crying outside her mud hut on a sweltering May afternoon. Her legs and arms were skinny while her belly was inflated--typical symptoms of malnourishment. Her eyes were glazed over and her nose showed some kind of an infection. Barely able to walk or crawl by herself, she looked much smaller than her age. Born at home, Chandni’s birth was not registered in her village, Khudariya in Nihi gram panchayat, also in Manikpur block, which lies in a dense forest. The village lacks basic amenities and armed robberies are common, so Savita had brought her daughter to a relative’s house in Khichari village, 7 km away. Government health workers do not visit Khudariya, and she is too poor to afford to visit a doctor or buy medicines, Savita said. This is why, despite having previously lost a two-year-old son to an infection, she did not deliver Chandni in a hospital and has been unable to take her to the doctor for treatment. It is to target such mothers and infants that Prime Minister Narendra Modi launched POSHAN Abhiyan or National Nutrition Mission (NNM) on International Women’s Day on March 8, 2018. Set up with a budget of Rs 9,046 crore ($1.3 billion), NNM aims to reduce, on a “war-footing”, stunting and low birth weight in children as well as anaemia in women and children. Uttar Pradesh’s Chitrakoot, 230 km from the state capital of Lucknow, is one of the 314 districts selected to be a part of the mission. Part of the rocky and arid Bundelkhand region, since 2006 Chitrakoot has featured among India’s most backward districts, qualifying to receive funds from the Backward Regions Grant Funds Programme. In 2018, it became part of the ‘Transformation of Aspirational Districts’ programme that aims to “quickly and effectively transform some of the most underdeveloped districts of the country”. IndiaSpend visited Chitrakoot, which had reported some of the worst health indicators in Uttar Pradesh (UP) in the fourth National Family Health Survey (2015-16), as well as Farrukhabad, among UP’s better performing districts, as part of an ongoing effort to assess government schemes aimed at tackling child malnutrition. In the first of our series examining government programmes to bring down child malnutrition, we examine how a stagnant economy and a near-complete failure of the government’s social safety nets are imposing a cost on Chitrakoot’s children’s health. Harsh geographical conditions, feudal social structures, inefficient government services and poor upkeep of law and order makes the Bundelkhand region one of the most backward regions in the world, according to the United Nations’ 2012 Human Development Index report. With little by way of industries, farming employs the largest proportion of people. However, land holdings are tiny, water scarce and harvests poor, the report noted. About one-third (30%) of the region’s population is below the poverty line. Within Bundelkhand, Chitrakoot ranked 12 among 13 districts on the index, and it is easy to see why. With just 51.14% of land under cultivation and supporting just one crop a year, people’s food security is severely compromised, said Ramji Pandey, chief medical officer, Chitrakoot. Eighteen percent of children are born underweight (below 2.5 kg), he said. While the district’s economy stagnates, all government safety nets have failed, from ration cards to jobs under the Mahatma Gandhi Rural Employment Guarantee Scheme (MGNREGS). Take Savita’s case. The relatives’ home where she was living with her infant daughter Chandni had no electricity and no toilet. There was barely enough food to go around, and the family had no ration card. No one in the family had received MGNREGS work since 2011, they said, adding that occasional daily wage labour supplemented the money sent by a son who has migrated to the city. Their neighbours are no better off. Mahesh and Phulkali, who also go by the last name Kol, which stands for their tribe, have four children. The youngest, Ruby, 3, has rough brown hair, a swollen belly and thin limbs--clearly malnourished. “Ruby falls ill so often, once we didn’t think she would make it,” said Phulkali, who has previously lost two toddlers to malnutrition and disease. Mahesh and Phulkali Kol with their children. Ruby, 3, centre, is malnourished and often falls sick. Mahesh and Phulkali work as daily wage labourers but work is difficult to come by on most days, they said. When IndiaSpend visited, they were selling tendu leaves (from the East Indian Ebony tree, used to roll beedi cigarettes) and earning upto Rs 200 per day together. Their ration card, which enabled them to buy government-subsidised food, expired two years ago and each time they applied to have it renewed, they were asked to submit documents that they did not have, Mahesh said. Their eldest daughter is married and their middle daughter, Arati, 15, has given up her studies to take care of her younger siblings. NNM’s main strategy is “intense monitoring” and “convergence” between various schemes. These linkages are entirely missing in Chitrakoot, where half the children under five are stunted (50.9%) and underweight (52.5%), one-third are wasted (33.3%) and nearly one-sixth are severely wasted (14.7%). This is much worse than the rate in Uttar Pradesh and India overall. While poor families are entitled to subsidised rations under the public distribution scheme (PDS), children up to age six get meals at the anganwadi (government-run daycare centres). Under the Integrated Child Development Services (ICDS) scheme, the world’s largest childhood care programme, it is the responsibility of the anganwadi to improve the nutritional and health status of children under six. It is also tasked with providing preschool education, immunisation, health check-ups and referral services. Anganwadi workers are responsible for maintaining records of children under six, regularly weigh them and track their growth. 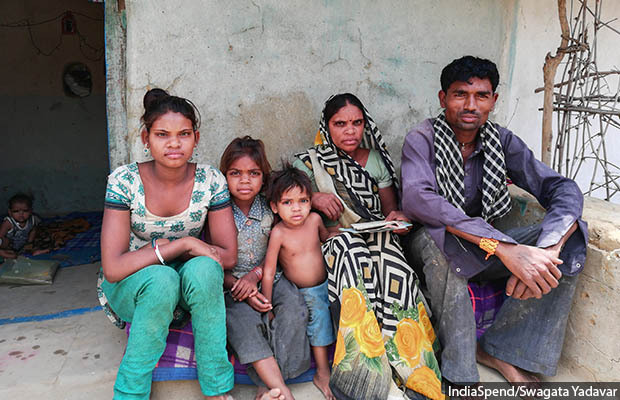 Families such as the Kols’ are getting neither subsidised food nor anganwadi services. There has been no hot, cooked meal in this anganwadi in Manikpur block for 1.5 years. No take-home rations, which have to be given to pregnant women and mothers with children younger than three years, have been distributed since January 2018. Anganwadis have to provide children below six with morning snacks in the form of milk, banana, eggs and seasonal fruit, as well as one hot, cooked meal in the afternoon. Children younger than three years as well pregnant and lactating women are entitled to take-home rations. However, all over Chitrakoot district, no hot, cooked meals have been served in the 1.5 years. Also since January 2018, anganwadi workers and local ICDS officials admitted that no take-home rations have been distributed. Uttar Pradesh’s ICDS director Rajendra Kumar Singh and principal secretary for the women and children’s department, Anita Meshram, did not respond to emails from IndiaSpend. Food being the key attraction for impoverished families, parents such as the Kols stopped sending their children to the anganwadi in January. 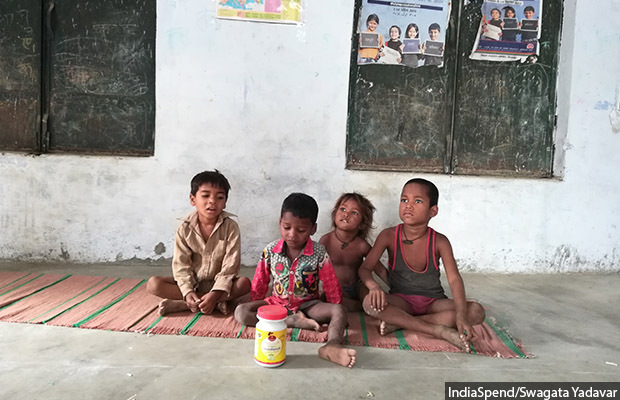 It is no surprise, then, that ICDS centres in Chitrakoot note that 17.9% of children under three and 18% of children aged 3-5 were moderately underweight, and 7.1% of children under three and 5.3% of children aged 3-5 years were severely underweight. Source: District Programme Office, Chitrakoot. Numerous posts in the ICDS department are lying vacant--one post of district programme officer (DPO) is vacant; there are only three child development project officers instead of the mandated six; and 13 posts of supervisor, 78 of anganwadi workers and 58 of helpers are vacant, said Rajesh Mishra, additional statistical officer at the DPO office. Most anganwadi centres are housed in primary schools and not in independent buildings. All through Chitrakoot, anganwadis and health centres are frequently without electricity and proper toilets. There was no electricity when IndiaSpend visited the community health centre at Manikpur. In the maternity ward, newborns and mothers had to deal with the sweltering heat without even a ceiling- or table-fan. The generator was not working, but an inverter kept the power supply on in the doctors’ and nurses’ cabins, but not in the wards. The chief medical superintendent, R.K. Singh, was trying to get a mechanic to come and repair the refrigerator used for storing vaccines. “There are no specialists--paediatrician, surgeon or radiologist,” Singh said, adding that instead of the eight doctors needed, there were five. 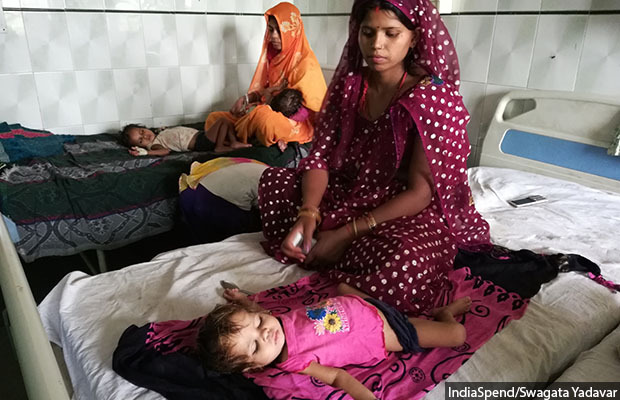 On a hot and humid May afternoon at the Chitrakoot district hospital’s nutrition rehabilitation centre, where children with severe acute malnutrition are sent until they gain 15% of their ideal weight, mothers sat beside their sickly children. “She can’t walk yet, she keeps falling and is lethargic,” said Gudiya, 24, of her 18-month-old daughter, Mahi, who was referred to NRC because she was underweight and had fever and pneumonia. Gudiya, 24, sits by her 18-month-old daughter Mahi at the nutrition rehabilitation centre in Chitrakoot. At NRC, Mahi gets World Health Organization (WHO)-recommended ready-to-use-therapeutic food and milk. Most children gain weight in two weeks, but lose it soon after returning home, said Richa Singh, a dietician at the NRC. The three leading factors that keep children malnourished are poverty, lack of education and large family size, she said. This last factor is evident in Gudiya’s case. Having got married in 2011, she has already given birth to four children, one of whom, a baby boy, died of pneumonia some years ago. All her daughters have been admitted at the NRC at some point in their lives. Poor nutrition, which directly causes malnutrition, has many underlying causes--poverty, of course, but also lack of education, poor sanitation, low quality of health services and ineffective nutrition programmes. Women’s well being, estimated from their body mass index (BMI), education, early marriage and access to antenatal care (ANC), could explain half of the difference between high and low stunting rates in India, a 2018 study by the International Food Policy Research Institute showed. Factors that could explain the difference in high and low stunting districts were women’s BMI (which accounted for 19% of the difference), 10 years or more of schooling (12%), age at marriage (7%), and access to antenatal care ANC (6%). Improving these indicators would reduce malnutrition, as would children's adequate diet (9%), the family’s asset ownership (of a house, access to electricity, toilets, a kitchen, clean cooking fuel, etc. ), access to banking services and low household size. In Chitrakoot, the per capita income in 2017 at constant price was Rs 32,588, roughly a third of India’s average of Rs 86,454. Only 67.3% of households have electricity, 11.6% have cleaner fuels for cooking and 15.8% have access to improved sanitation facilities--much below the national and state average. The district performs particularly badly in women-related indicators--less than a quarter of women (22.1%) have more than 10 years of schooling and a third (31.1%) are married before the legal age of 18. Although 74.1% of births are institutional, closer to national average (78.6%), only one-sixth of women get at least four WHO-recommended antenatal check-ups. Only 2.3% get all the recommended antenatal care. With early marriage, poor education, poor family planning and inadequate access to care during pregnancy, less than half of all children are exclusively breastfed (46.8%) and only one in three (33%) get the required complementary feed after six months. Coupled with the fact that mothers here have more than three children on average, each child receives very little of the attention that it needs. 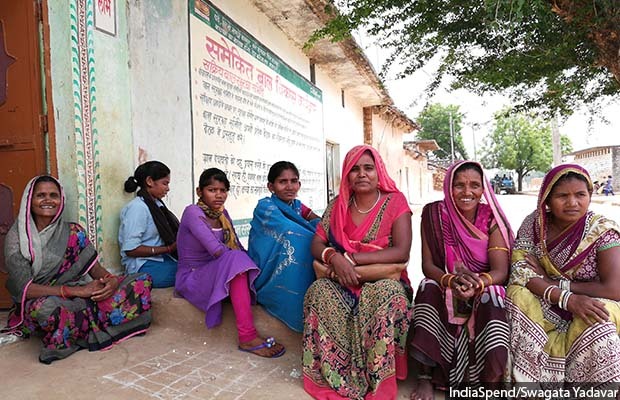 Focusing on women’s well-being and empowering them can create a revolution, as Azad Purwa village in the Mau block of Chitrakoot has found out. Until a few years ago, Azad Purwa was like the villages we described before--without adequate water and sanitation, and a high infant death rate. Today, it presents a pleasant contrast to the rest of the district, with each house bearing beautiful murals and raised platforms to sit under shady trees. Change began some two decades ago, when Sarvodaya Sewa Ashram (SSA), a non-profit that works to change mothers’ behaviour from pregnancy until the child is two years old, began to educate villagers about the importance of hygiene, immunisation, institutional deliveries and health rights. Rukmini Devi (far left), Renu Devi from Sarvodaya Sewa Ashram (third from right) and Meera (second from right) with fellow Azad Purwa residents. “Women used to deliver at home and many children used to die during delivery itself,” said Rukmini Devi, 45. “Now everyone in the village goes to the health centre for antenatal check-ups and for deliveries,” she said. Showing us a vegetable patch she grows, she said her family supplements its income by rearing chickens, goats and cows. She also pointed to a well the villagers have dug nearby. Studies have shown how women, being primary caregivers, can influence their children’s nutrition indirectly through their own nutritional status as well as directly through childcare practices. Several studies from Pakistan, South Asia and Andhra Pradesh show that women’s empowerment is associated with reduction in stunting and improved nutritional outcomes in children. In order to reduce childhood malnutrition on a “war-footing”, Chitrakoot would not just need better funds and efficient government services but must also ensure that women get education, access to finances, better sanitation and more decision-making power. It was no coincidence that the Prime Minister launched the National Nutrition Mission on International Women’s Day.